For this photograph titled A Room Filled with an Obnoxious Amount of Money, I simply withdrew $871 from the bank and then used the multiplicity photography effect to fill the room up with cash. 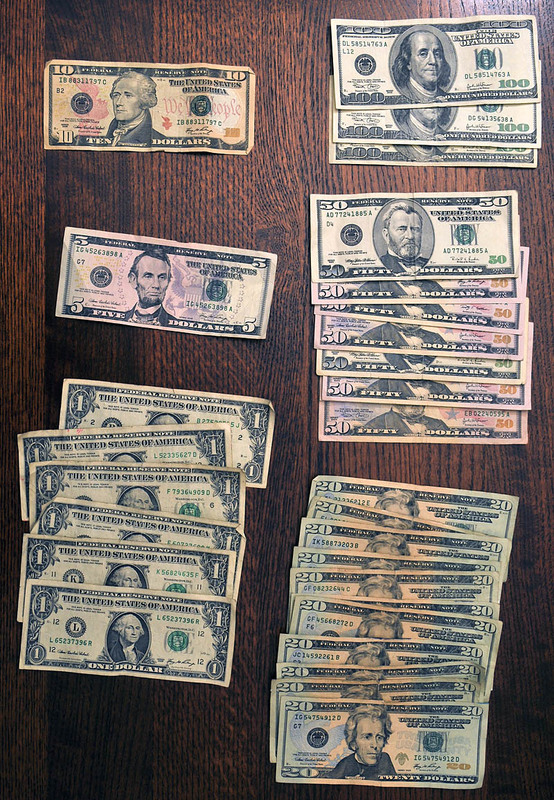 This process roughly took 7-10 hours: roughly 4 hours taking the actual pictures of the money with my DSLR on a tripod; as you can see, I've put the money inside of picture frames, taped it walls, folded it around window blinds, mounted it in piles, and stuffed it in drawers and glass jars. Post-processing the 170 individual frames in Adobe Photoshop CS5 took roughly 5 hours. This is a 2 shot vertical panorama (Everything shot in JPEG) with some HDR toning applied at the very end with the Topaz Photoshop plug-in. This looks like an obnoxious amount of money, but it was really only $871, as you can see below. 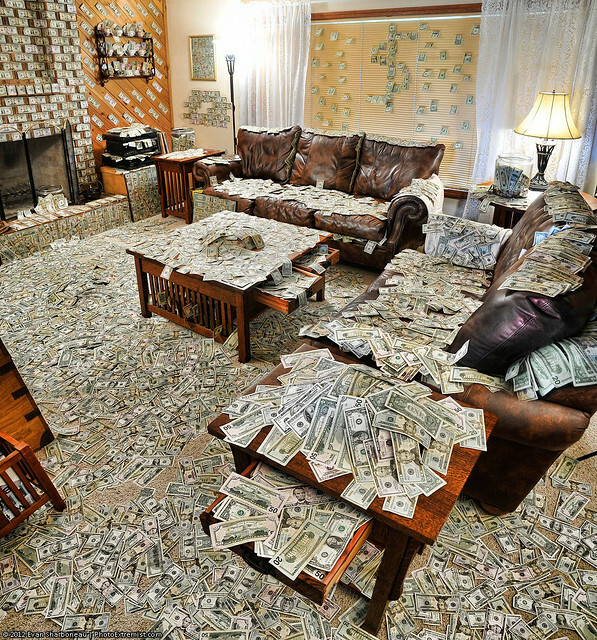 If you take this $871 and then multiply it 170 times, this room would be filled with $148,070 USD. If you add the amount of money perceived inside the glass jars and underneath the heaping piles, this room could easily add up to a million US dollars or more. Pretty cool! I'm rich with American currency, and it only took me 9 hours! The multiplicity photography effect is explained in the video tutorial linked above. 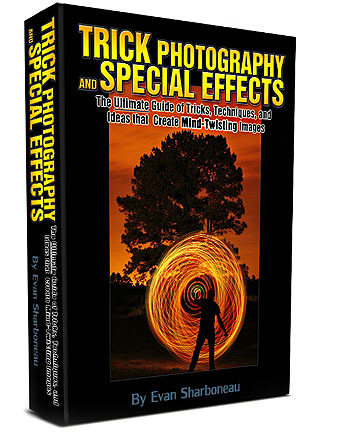 Plus, if you want an entire structured library of unique photography techniques, consider purchasing my instructional how-to e-book and online video course Trick Photography and Special Effects, which explains the camera techniques used to create creative images just like these ones. This post is very important . enjoyed it!! love the work on the photo there. thanks gona become helpful for me. It’s a really expensive design. thanks for sharing. How amazing post you have published your well article made me glad . Thank you guy . lIt’s a piece of good resource. I found lot of necessary information from the article. Thanks once again for sharing the article. Keep it up.